The floor pulses with colored lights to the beat of the music that envelops you. You dance to the beat, and you can’t remember a time before the beat. People surround you in all directions for as far as the eye can see, but it isn’t crowded or stifling in any way. Everyone has their space to perform the physical spectacle of their choosing, and nobody feels inhibited. What could this place be? Will you be able to find it again once you’ve gone? I love this band, and I thought it suiting to dedicate my 50th “review” to an album by a musical act that means a great deal to myself. Why Make Sense? 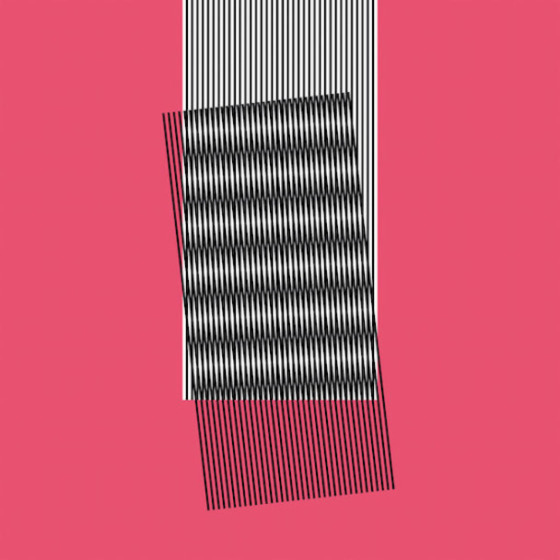 is the newest full-length from Hot Chip, an act that truly require no introduction at this stage in their trajectory. These seasoned sonic innovators can do no wrong, and have yet to release even a mediocre record. I’m pleased to state that this release exceeds the loftiest expectations. For those unfamiliar, this group inhabit the most melodically satisfying corners of funk, house, pop, and r&b, with some extra experimentation thrown in for good measure (I’m looking at you, “White Wine and Fried Chicken”). And damn, do these guys know how to write hook after hook. I’m not exaggerating when I say that every single one of these tracks possess the earworm capability to lodge themselves deep in the listener’s mind. This band is composed of highly adept multi-instrumentalists that have groove down to a science. Owen Clarke, Al Doyle, and Felix Martin hold the reins on what you could call the rhythm section, but is actually the melodic and rhythmic foundation for the wonderfully contrasting vocals of Joe Goddard and Alexis Taylor. If you’re seeking melodically-superb music with a beating heart of groove, this album is for you. An incredibly rare and sought-after artifact has come into your possession: an antique radio receiver with a tuner (imagine that!). This is perplexing, because you were under the concrete impression that the last radio station cut transmission decades ago. This device doesn’t broadcast the latest hits, but rather the inner musings and laments of those in relationships that support as much as they destroy. You turn it on, and slowly turn the knob . . . In order for it to hold significance, music doesn’t need to be radical or revolutionary; sometimes all it takes is creating something honest, something that illustrates the inescapable thoughts we all share at some point or another. 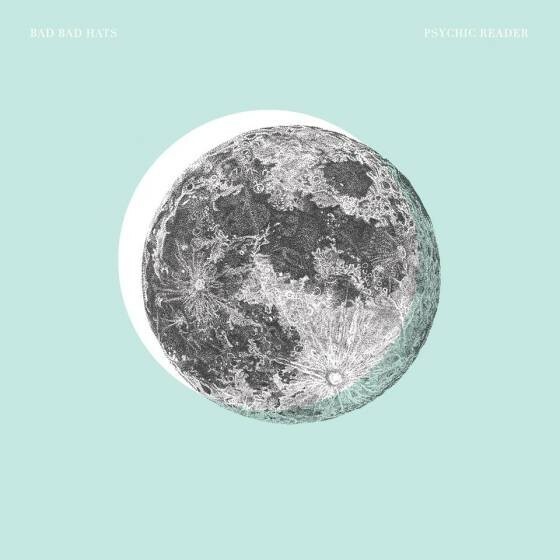 Psychic Reader is the debut full-length from Minneapolis-based band Bad Bad Hats, and this trio of charmers have filled this record with some of the best, most relatable pop you’re likely to hear this year. This is a group that knows how to sear their music with experimentation, rather than drench them in it. Noah Boswell and Chris Hoge, on bass and drums respectively, hold down the rhythm section with admirable consistency and provide the most ideal foundations for vocalist/guitarist Kerry Alexander to speak her truths. It’s pure jangly pop on the surface, but there’s a uniquely experimental vein running through each song. Although each instrumental element is integral to the allure of this band, it’s Alexander’s charismatic persona that sets them apart from other indie-pop heartbreakees. She’s Hop Along’s Frances Quinlan, but more subdued and focused; she’s Beach House’s Victoria Legrand, but more lively and transparent. They’re truly a triforce of tasteful songwriting. If you’re seeking catchy, superbly-crafted pop, this album is for you. The ship roars as you descend to the planetary surface. Years of travel, and it’s time to experience the fruits of your labor. The rumbling halts, and all is quiet. After a few moments, you open the vessel’s hatch, test the atmosphere, and exit the compartment you’ve called home for so long. Grassy plains are in all directions, and you see a plume of smoke in the distance. You walk a long while before approaching a village, and an apparent celebration . . .
It’s a beautiful thing when seemingly disparate influences of creativity come together to craft something more astounding and incredible in the sum than in the separate pieces. 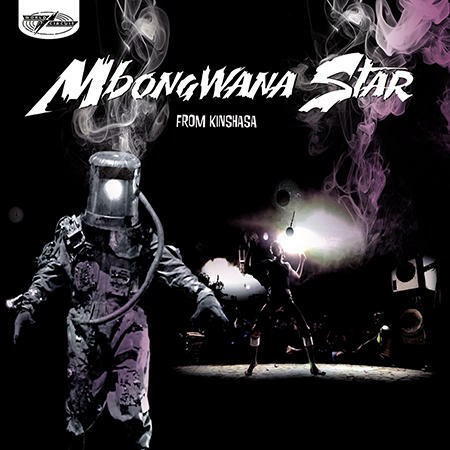 From Kinshasa is the debut full-length from Mbongwana Star, made up of Coco Ngambali and Theo Nsituvuidi. For this record, the duo drafted Irish producer Liam Farrell to construct a spacey, futuristic aura around the group’s lively songwriting. Ngambali and Nsituvuidi vocalize in Lingala, a Bantu language indigenous to the Democratic Republic of the Congo. They weave cascading adlibs, lush harmonies, and rhythmic outbursts together to invoke a communal spirit that’s vigorously celebratory at times (“Shégué,” “Malukayi”) and breathtakingly serene during others (“Coco Blues”). It’s equal parts chaotic and catchy, with distinct cultural sounds gorgeously infused. Farrell’s studio wizardry is what takes this record full of traditional central African hip-hop, r&b, reggae, and rumba, and transforms it into an celestial, genre-bending exploration through sound. Mix all of that with this duo’s exceptional ability to write rewarding hooks, and you’ve got yourself a truly unique experience. If you’re seeking eclectic, ethereal music with a distinct central African touch, this album is for you. Nightfall consumes a recording studio, plunging everything into a deafening silence. Suddenly, the computers, drum machines, synthesizers, and every kind of assorted hardware and software whirr with life. They play catch with their samples, dance with their rhythms, and sing with their tones. The countless sounds compiled over the years are weaved together into a tapestry of something strangely new and comfortably familiar at the same time . . .
Here’s one for the scatterbrained, experimentally-minded listeners. 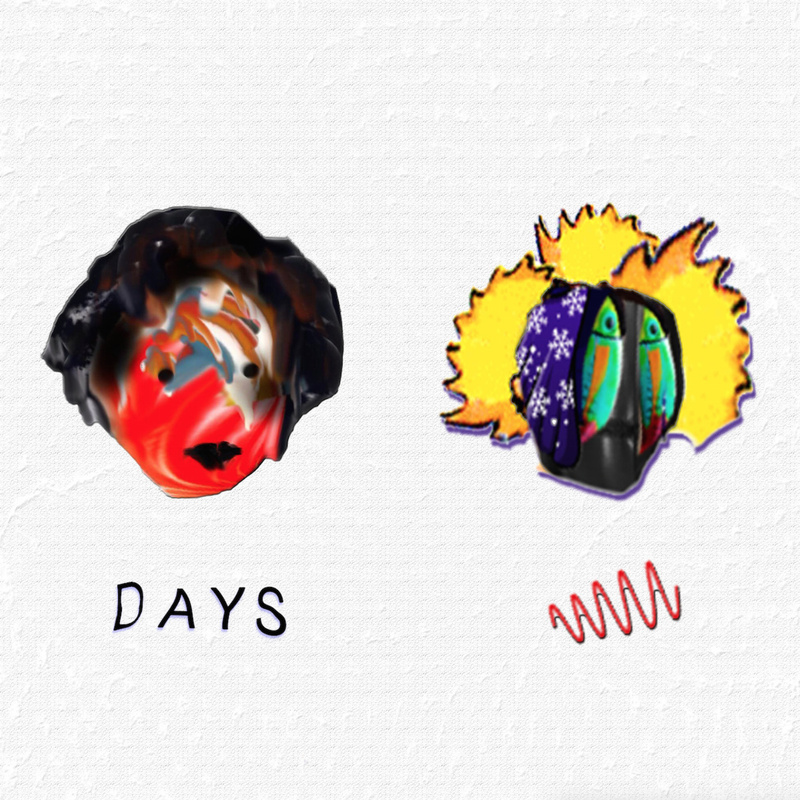 Days is the newest full-length from North Carolina noise-crafters Earthly, made up of best friends and ex-college roommates Edaan Brook and Brint Hansen. The album title represents the painstaking amount of time surely required to amass and formulate this treasure trove of samples, and the meticulously detailed production style of this visionary duo. Those eagerly awaiting a fresh release from The Avalanches or The Books can cease holding their breath, because this record is a gem of the collagist method. These artists subscribe to an “all but the kitchen sink” doctrine, utilizing everything from bubbly video game samples, to classic film snippets, to chopped commercial fragments. This grab-bag mixture is surreal at times, uncanny during others, and always melodically catchy. Nailing down the encompassing genre(s) of this record is a fruitless task, because this pair revel in finding new ways to surprise and thrill the listener with sporadic structures. Nothing is off-limits, including dance floor-primed grooves, ambient soundscapes, and exploratory “noise pop.” It all sounds incredible, but you’ll exit just as baffled as when you entered. If you’re seeking experimental, collagist music, this album is for you. You spin in a circle, hands clasped in the grip of your loved one. You both count down from three and fall back onto the grassy cushion. You roll to the bottom of the hill, where everyone from your town are gathered and celebrating lord knows what. Lights on strings are strewn through the trees, and laughter fills the warm air. A band is setting up on a nearby stage. Someone inquires with “you heard a’ these cats?” and you haven’t. You sit and listen . . .
It’s time to take a much needed trip back to the soulful past. 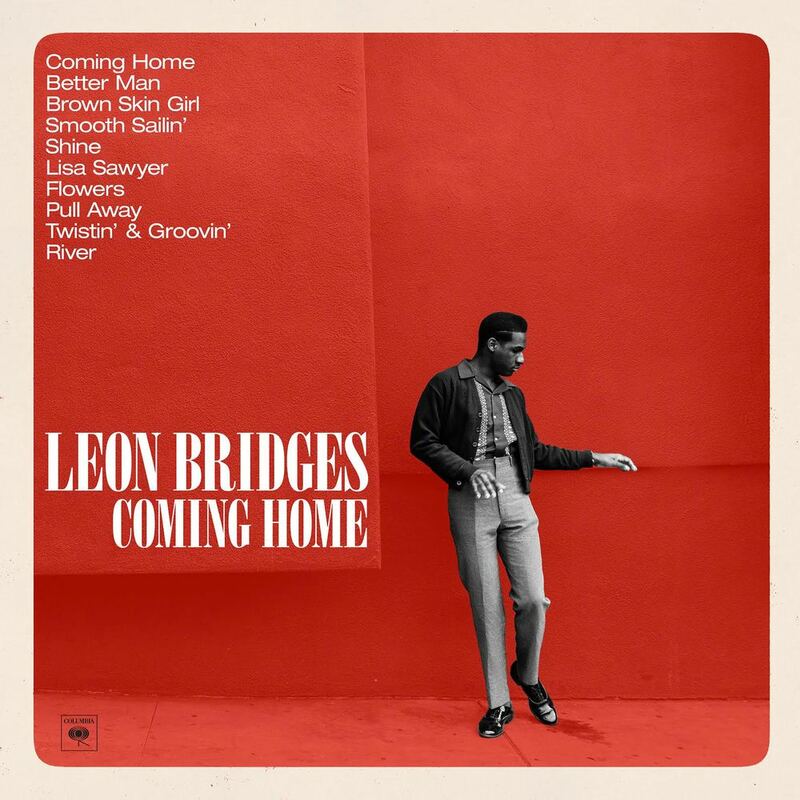 Coming Home is the debut full-length from Leon Bridges, a singer with a voice of golden butter. This artist wholeheartedly invokes the nostalgic sounds of classic r&b on this record, but he succeeds in carving out a place for his unique persona to thrive. Even though these songs are brand new, they sound like they could be pristine hits from a vintage era. Bridges is in good company when it comes to his backing band, consisting of Josh Block and Austin Jenkins from White Denim. This duo of proficient studio wizards match Bridges’ mentality perfectly, with fuzzed-out guitars and organ, honky-tonk horn arrangements, and some gorgeous, gospel-tinged backing vocals. It’s the ideal environment for this past-minded singer to take center stage and flourish. And damn, does he flourish. Bridges approaches such a delicate and historically-lauded style with the grace of a champion. Hopelessly romantic balladry is this man’s forte, but his voice also shines when accompanied by more upbeat, hip-shaking instrumentation on “Smooth Sailin’,” “Flowers,” and “Twistin’ & Groovin’.” Have a beating heart? You’ll be into this one. If you’re seeking soulful, classic r&b, this album is for you. You sit within a vast audience inside a grand hall suspended among the stars. A galaxy will be birthed soon, and a commemorative symphony will occur in its honor. Eager patrons shuffle and stumble through long aisles before finding their seats. The creation of a galactic body is breathtaking, but it is also chaotic and quite deadly. The performed music will embody both sides of the spectrum. Prepare for a performance unlike any other in the universe . . . If “classical” and “experimental” function as descriptors for the music you enjoy, there’s a legitimate chance that this record could become your new favorite. 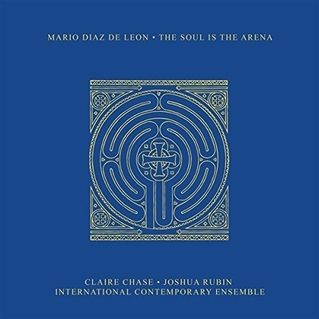 The Soul Is The Arena is the newest full-length from accomplished composer Mario Diaz de Leon. Across these three equally fascinating and contrasting pieces, the skilled artist melds his all-encompassing electronics with an all-star cast of prodigious symphonic musicians. The first two songs are duets, while the third operates as a vivid illustration of the far-reaching possibilities of chamber music. “Luciform” is an entrancing conversation between Diaz de Leon and flutist/MacArthur “Genius Grant” awardee Claire Chase. Title track “The Soul is the Arena” challenges the listener with a noisier dialogue between synthetics and Joshua Rubin’s versatile bass clarinet. It’s abrasive and beautiful. Diaz de Leon fills the latter half of the record with “Portals Before Dawn,” an exploration through the experimentally-sublime capabilities of symphonic instrumentation. He plays synth and surrounds himself with a proficient collective of musicians from the International Contemporary Ensemble, producing some gorgeously picturesque sounds. If you’re seeking mind-expanding symphonic music, this album is for you. Just moments before collapsing in the forlorn darkness, you scrape the wall of earth and reveal a pinhole of light. Adrenaline takes you, and the final efforts are short work. You fall to your knees into warm sand. Your eyes haven’t adjusted, but you hear the ocean beside you. You rise to your feet once you can see, and begin to wade through the silky powder. You sit in a chair. Someone hands you a ice-cold drink. You notice people all around you, relaxing . . .
“Warmth” might be my favorite attribute in sound. If you hand me something to listen to that grants me the feeling of being wrapped in a blanket or reclining on a sunny beach, chances are I’m aboard. Comme Ça, the newest release by Latvian producer Domenique Dumont, satisfies that craving more than any other piece of music released in a long time. At six short tracks, it’s effortless to digest, and impossible not to fall in love with. 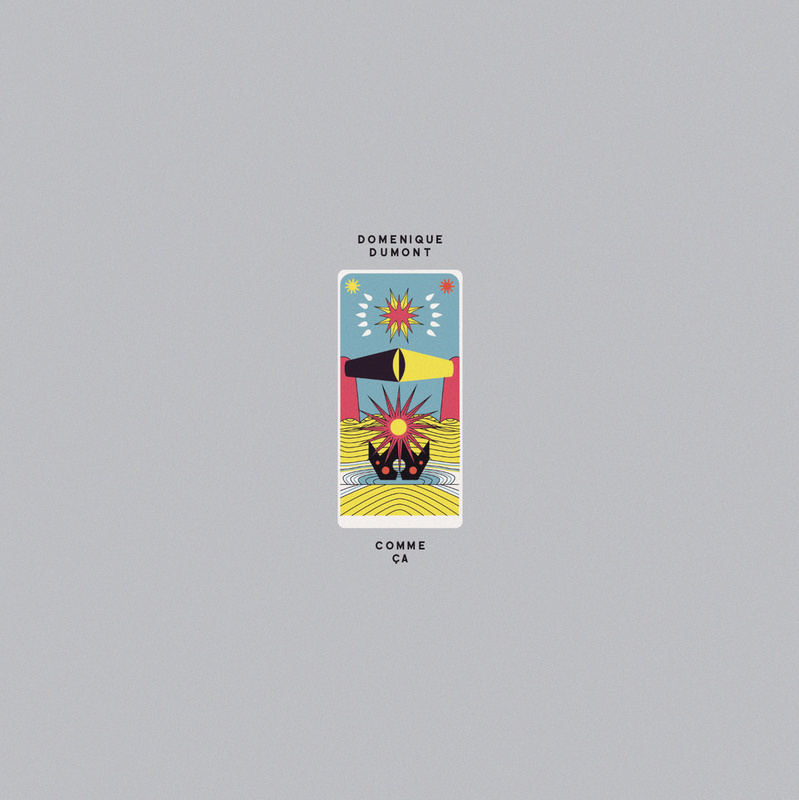 The first portion of this record dwells in dubby, Balearic dance music with melted edges. Lush synths and steel drums blend with ethereal French vocals to create a simple and lovable concoction. Absorbing an entire full-length album of music within this vein would be a treat, but it’s when Dumont jumbles the formula during the rest of the tracks that he truly shows his songwriting expertise and knack for sonic ingenuity. He initially dives into vigorous Afro-house on “La Basse Et Les Shakers,” but then the record takes an atmospheric and experimental left turn. “Un Jour Avec Yusef” and “La Bataille De Neige” trip through twinkly, subaqueous dub, while “Le Château De Corail” ends the vacation with dreamy, tropical ambience. It’s deceptively simple, and highly enjoyable. If you’re seeking blissful, warm music, this album is for you.